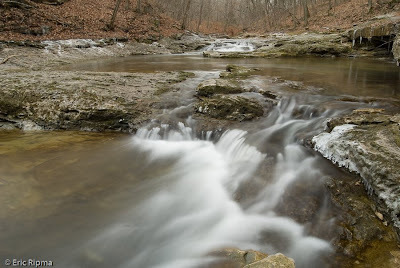 All of the following photos are from McCormick's Creek State Park in Indiana. Every time there is precipitation the entire scene changes making every visit very interesting. Luckily for me I go to Indiana University which is only about 15 minutes away. 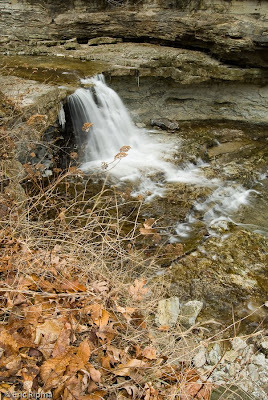 To make any of the waterfall images that I post I use long exposures to get the soft smooth feel for the water. Without a tripod this would not be possible unless you set your camera somewhere stable before releasing the shutter. In the above shot, foam was forced to swirl under the falls creating a great opportunity for some interesting shots. I used a 2.2 second exposure on the above shot. This was taken from on top of the ridge above the falls. I like the foreground grass and leaves on this one. I am almost always down in the canyon right next to the falls but I do like the new perspective. 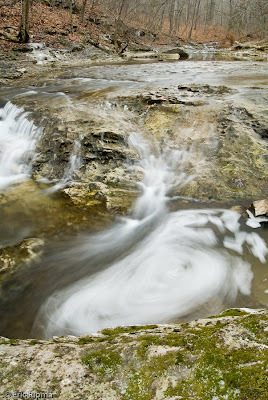 Absolutely fabulous water photos, I added your blog to my followers list, I can't wait to see more of your photography. I really like the motion in the second photo.Great shot! Awesome shots Eric. The water foam is so soft looking. Great tips. =) Don't have a camera that can take such wonderful shots though. Your photos are quite interesting - not to mention beautiful - and I appreciate you adding the tips, too, as I'm just learning a few things as I go! I really love the soft look of the water - that's so EyE Catching! Just to get a little wild here, because you took long exposures, it looks like you took a photograph of the waters energy... really wonderful! BTW-we linked to your blog in our's.Hope you don't mind. Wow, thanks for the photo tips. I like the foams, you really captured it excellently. Thank you for sharing how you captured the water. I've wondered with some of your other posts. I love the new perspective. I wish I had that much camera knowledge to get those kind of shots. Truly beautiful. I love those swirl. Great capture. You did a beautiful job. Great shots! But the one in the middle is really beautiful! Love the angel on that one - the water is coming towards me! You did a great job with these shots. I love water and nature which I'm sure you have plenty of. Love these and I enjoy the fact that you have explained how you have taken your photographs. Thank you. Nice! State (and provincial) parks are fun place to explore with a camera.